Moving may easily become one of your worst nightmares. But the aim of California Movers is to help people by providing them with the Moving Service that reduces stress and tension. 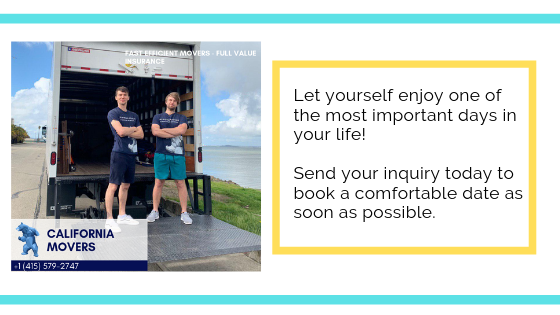 With the highly trained moving teams, California Movers can help you to forget about any problems and to experience your moving day as the best day ever! Spacious driving-up and a climate-controlled system assure that your things will be handled and preserved securely with any required conditions. Every order is performed by one team. It means, one team of expert and friendly corporate movers and packers will handle your day from the very beginning till the end. We disassemble and reassemble massive furniture pieces, rewrap and tape everything and arrange the pieces in the truck in an order that ensures its safe haulage. We make a plan and route of transportation and precisely follow it while preparing a plan B in case if any unexpected situation emerges. Our company is ready to take care of you anytime. If you want to have a moving day at the weekends or at night, we are ready to help you! The aim of our company is to provide clients with the most comfortable, reliable, respectful moving service. That is why we guarantee affordable prices without hidden fees.